If you buy your power from your municipality – e.g. City of Cape Town, City Power (Johannesburg) etc – then your price rise won’t be arriving until July. However, don’t think you’ve got off lightly, right now speculation is still rife that the price rise in July may be as high as 25%! More on that once we know more… the rest of this article is for Eskom direct buyers only! If you are an Eskom direct customer, and you’re on prepaid, there is an opportunity to ‘fill up your tank’ before the price rises tomorrow. But you need to do it smartly. If you just go out and buy R1000 of prepaid credit you could be paying 70% MORE than you need to, all by trying to save 12%! As we mentioned last year the price will rise on April 1st, but you get the chance to stock up on older cheaper units. As far as your meter is concerned all the credits are exactly the same; you just pay more for them. The reason it’s not as simple as filling up your petrol tank (also something you should do before Midnight Wednesday – as that is also rising by R2/litre — see here) , is that there is an inclining block tariff. 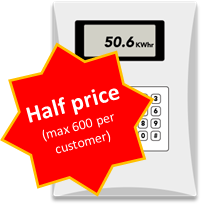 This means that the first 600 units you buy each month are at 40% off (assuming you’re on a 60A Homelight supply). 1. You usually buy MUCH more than 600 units — i.e. spending R1000, R2000 per month. In this case, you should just buy a huge extra amount. BUT, make sure you keep buying 600 units every month after — that’s R650 on the new tariff. For example if you normally spend R1000 every month (i.e. you use 860kwh/month), then spend R3500 this month — buying you 2400 units; but then buy only spend 650 every next month and carry on spending at least R650 every month. Doing this will save you 12.7% on very extra rand you save. In the example above, it should take you around 6 months to use up the extra units. So R2500 extra invested, giving you R300 return in 6 months. Not bad hey! 2. You usually buy less than 600 units — that’s R575/month. If this is the case, you should make sure you DO get ALL of your cheaper units by spending R575 this month (actually R573.66 to be exact) this month. Then, next month just buy what you need –> i.e. don’t buy until you need it. So, say you normally buy R200 every month. This month you should buy R575 worth — getting your full 600 cheap units. Next month don’t buy anything, and the month after buy whatever you need. This should save you about R50. Again, R375 invested, to save R50 in one month. Not bad at all! We’ve updated our ‘filling up the tank’ spreadsheet for all your number-lovers. Enjoy! Thank you for your in-depth analysis of the magnitude of the Escom disaster as reflected in their ridiculous price increases. In other words, a 25% increase in electricity prices for any one year should result in the Rand falling by 25% against the US dollar, with a suitable time lag! Some member of Escom, with an Indian name, claimed Escom power was still amongst the cheapest in the world. If this claim has any merit at all, it is because the Escom debacle has precipitated the incredible rise in inflation in SA. Looking at it the other way round, if we assume that there was “zero” inflation in SA since, say, the year 2000, then our electricity price would be more than double that of the next highest significant country!